For golfers of all skill levels, GOLF SMARTER provides course management strategy, tips, drills, advice, and insights from PGA Professionals. An audio podcast that’s guaranteed to make you a better golfer. Now the highest ranking, longest running golf podcast in iTunes. With more than 675 episodes, host Fred Greene goes in-depth each week searching for ways to raise our golf IQ and achieve lower scores. You now get TWO new episodes each week with Golf Smarter and Golf Smarter Mulligans. Podcast apps only carry 300 episodes of any show, but because our library has more than 350 interviews that are no longer available, more than a third of which are great golf instruction, we want you to have access to more content to improve your game. All the experts agree: You play better and have more fun when you GOLF SMARTER. Fred Greene is the creator and host of GolfSmarter. He has the eyes, ears, heart, and timing of a great story teller, along with an obsession for new technology, and a passion for production. His creative consultation and production services have elevated the brands of Hewlett Packard, the NFL, Anheuser-Busch,Troon Golf, Robert Half International, and numerous municipalities and non-profit organizations. Fred thrives on unleashing his energy on the next project. From development through distribution, Fred’s experience as producer, editor and crew, along with his vast network of specialists, make his videos your most cost effective marketing tool. Fred is also a podcasting pioneer. 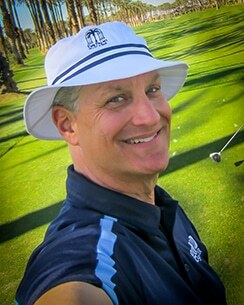 As host of the top rated “Golf Smarter” podcast each week since 2005, he is highly skilled at developing content that establishes thought leadership and builds brand awareness.